This sky map shows the location of the constellation Ursa Minor (Little Bear), the star pattern from which the annual Ursid meteor shower appears to radiate from. 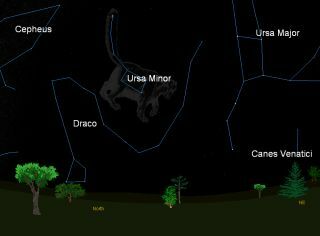 This map shows where to look at 10 p.m. local time on Dec. 22, 2011 to find Ursa Minor in the northern night sky from mid-northern latitudes. When skywatchers think of meteor showers during the month of December, they immediately think of the Geminids, which over the years has evolved into the most prolific and reliable of the dozen or so annual meteor displays that take place. And yet, there is also another notable meteor shower that occurs during December that in contrast, hardly gets much notice at all: The December Ursids. The peak of annual Ursid meteor shower usually occurs on the night of Dec. 22 and 23. They are so named because they appear to fan out from the vicinity of the bright orange star Kochab, in the constellation of Ursa Minor, the Little Bear. Kochab is the brighter of the two outer stars in the bowl of the Little Dipper (the other being Pherkad), that seem to march in a circle like sentries around Polaris, the North Star. The Ursid meteors are also sometimes known as the Umids, in a rather unsuccessful attempt to make clear that their radiant is in Ursa Minor, not Ursa Major. The fact that Kochab is positioned so near to the north pole of the sky means that it near never sets for most viewers in the Northern Hemisphere. And since the Ursids seem to fan out from this particular region of the sky, means that you can look for these faint, medium-speed meteors all through the night if you care to. You can also pass the time by searching for some of the seven major planets of the solar system visible in the night sky this week. In a rare skywatching treat, Mercury, Venus, Mars, Jupiter and Saturn can be seen by the unaided eye over the next few days. Uranus and Neptune can also be seen using telescopes. The fact that the Ursids reach their peak during the overnight hours of Dec. 22 and 23 is good news, at least so far as trying to catch of view of them in 2011, since the moon hits its "new" phase on Christmas Eve, assuring dark skies. As British meteor expert Alastair McBeath notes in this year’s edition of the Astronomical Calendar (edited by astronomer, Guy Ottewell): "December's New Moon gives a perfect chance to end the year positively, if skies are clear enough to see what the Ursids may do this time." And this is indeed a fortunate circumstance because the Ursids "badly need observing," according to the British Astronomical Association. That observers have neglected the Ursids is not surprising. Everything about them is wintry. They usually coincide with the winter solstice, and are best seen by polar bears since they come from near the celestial north pole. In contrast to the Geminid meteor shower, which can produce up to 120 meteors per hour, the usual Ursid rate is but a fraction of that. Generally speaking, the Ursids produce about a dozen or so meteors per hour at the shower's peak. They are actually the dusty debris shed by the periodic comet Tuttle 8P/Tuttle, which circles the sun in a 13.6-year orbit and was last seen in early 2008. On occasion, the Earth has interacted with a dense, narrow stream of particles shed by this comet, which has caused brief outbursts of Ursid meteors numbering in the dozens per hour, such as in 1945 and 1986; others may have been missed. But unfortunately no such interaction is expected this year. If you snap a photo of a dazzling Ursid meteor shower and want to share the image and experience with SPACE.com, contact Managing Editor Tariq Malik at: tmalik@space.com.